Parkinson’s disease can negatively affect many aspects of a senior’s life, but staying actively engaged can alleviate some of the symptoms associated with the disease. With careful planning, family caregivers can find various activities that are less intrusive and can be performed in moderation. Here are some safe and engaging activities that seniors with Parkinson’s should try. Crafting is not only fun and safe, but it also provides long-term health benefits. Knitting is one of the best crafting ideas for adults living with Parkinson’s because it increases motor function. Crafting is a mentally stimulating way for seniors to alleviate worry, doubt, and depression. Participating in crafting projects can reduce stress related to Parkinson’s and slow the progression of the disease. If your senior loved one needs help managing an illness or assistance with daily tasks, make sure you choose a top-rated home care company. Oshkosh Home Care Assistance is here to help your loved one live a happier and healthier life in the golden years. 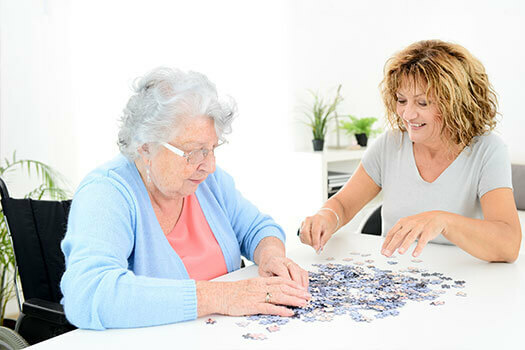 From the mentally stimulating activities in our Cognitive Therapeutics Method to our friendly Care Managers who are available to answer your questions 24 hours a day, we offer a wide array of high-quality at-home care services. Your loved one can donate his or her time and volunteer with a community organization or local program. Check if there are any organizations nearby that are advocating for Parkinson’s in regards to research, financial assistance for people living with the disease, and educational programs for family caregivers. Seniors living with Parkinson’s may begin to isolate themselves, but volunteering is an engaging activity that can enhance socialization skills and reduce the risk of depression. For families living in Oshkosh, Wisconsin, respite care can be a wonderful solution when their aging loved ones need companionship and socialization a few hours a week or just need minor assistance with daily household tasks. At Home Care Assistance, we thrive on helping seniors maintain their independence while living in the comfort of home. Encourage your loved one to write about his or her experiences in a journal, for an online blog, or in a memoir. The writing should detail how your loved one feels about living with the disease and include different ways Parkinson’s has impacted his or her life. Writing is an engaging activity that can also be therapeutic for seniors living with Parkinson’s. Sharing the literary work could make your loved one feel mentally and emotionally stronger. Dancing can increase balance. When your loved one moves to the rhythm of the music, he or she may prevent freezing episodes associated with Parkinson’s. Almost any form of exercise, including dancing, can help seniors with Parkinson’s alleviate symptoms related to gait and flexibility. Dancing is a fun and engaging way to keep the brain active and anxiety levels down. Painting is a creative form of art that provides seniors with an emotional escape from the realities they currently face, and it only requires small movements from those living with Parkinson’s disease. The movements are also controlled, making it easier to enjoy the activity instead of worrying about failure or causing bodily harm. Painting and coloring can help older adults manage tremors and other symptoms associated with Parkinson’s. When seniors develop Parkinson’s disease, their families are not always able to provide the care they need and deserve. Oshkosh, Wisconsin, Parkinson’s care experts are available around the clock to help seniors maintain a high quality of life while managing the symptoms of Parkinson’s, allowing families to enjoy greater peace of mind. To learn about our Parkinson’s care plans, give Home Care Assistance a call at (920) 710-2273 today.